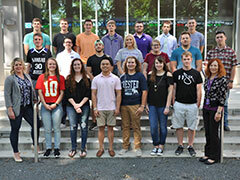 The College of Business Administration, with the assistance of funding from a K-State Summer grant, welcomed 21 transfer students to campus this August to get a Jump Start on their success at K-State. Jump Start students came from 14 different two-year institutions from across the state of Kansas. Each participant received a $250 scholarship and a free book. The objective of the Jump Start program is to help transfer students with their transition to K-State, and to get them prepared for the fall semester. The students completed three courses over the span of three intensive weeks: GENBA 105 — Business Orientation, GENBA 205 — Career Accelerator, and GENBA 110 — Business Foundations. The business orientation course was taught by each student's assigned academic advisor, who worked with the students to craft individual long-range plans for each students' program of study and extracurricular activities. Engaging with the Career Development team and completing the required Career Accelerator course also allows students to confidentially attend career related activities and events in their first semester, including the recent All-University Career Fair. "Transfer students who participated in Jump Start last year saw an average GPA that was almost .4 points higher than other first semester transfer students," said Bente Janda, assistant dean for undergraduate student services. "We are very proud of this program and the impact it has on students, and look forward to welcoming another group of students next year." For more information about the program, visit the program website. Applications for next year will open in February, 2019.